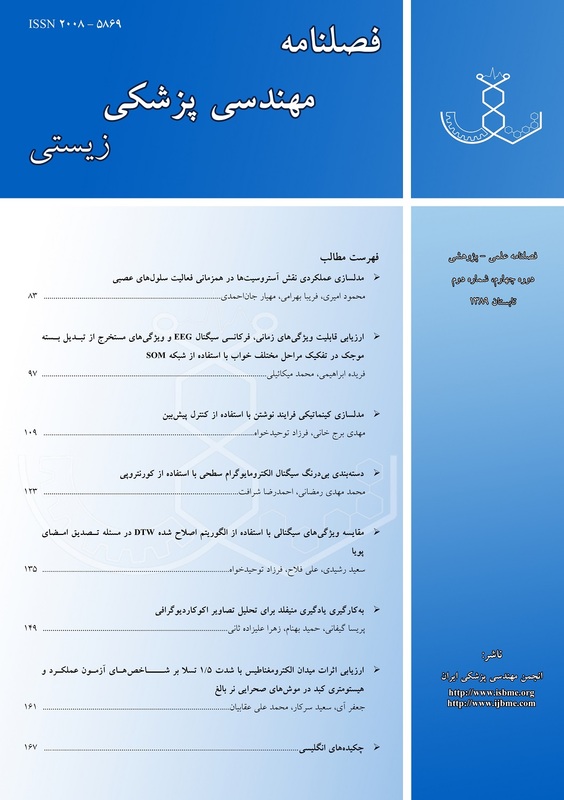 در این مقاله با استفاده از کورنتروپی، روشی مؤثر برای دسته‌بندی سیگنال الکترومایوگرام سطحی به منظور کنترل پروتزهای مایوالکتریک ارائه شده است. چون سیگنال الکترومایوگرام سطحی در دامنه‌های پائین نیرو ماهیتی غیرگوسی دارد درحالی‌که اغتشاش محیط گوسی فرض می‌شود، از کورنتروپی برای استخراج ویژگی از این سیگنال استفاده می‌کنیم؛ زیرا کورنتروپی تنها دربرگیرنده اطلاعات مربوط به مؤلفه‌های غیرگوسی است و تخمین آن از نمونه‌های محدود بسیار ساده است. سپس با به‌کارگیری ویژگی‌های استخراج شده، از طبقه‌بندی کننده آنالیز تفکیک خطی برای دسته‌بندی سیگنال الکترومایوگرام سطحی استفاده می‌کنیم. نتایج به‌دست آمده با استفاده از روش پیشنهادی این مقاله، در مقایسه با نتایج سایر روش‌های پیشرفته شناسایی الگوی سیگنال الکترومایوگرام سطحی هم بهبود یافته و هم محاسبات کمتری دارد. In this paper, we propose a novel approach for classification of surface electromyogram (sEMG) signal with a view to controlling myoelectric prosthetic devices. The sEMG signal generated during isometric contraction is modeled by a stochastic process whose probability density function (PDF) is non- Gaussian for low levels of applied force. Since the PDF of ambient noise is assumed to be Gaussian, we extract correntropy features, as they contain information on non-Gaussian components (the sEMG signal) only; and utilize the linear discriminant analysis (LDA) to classify the sEMG signal using correntropy features. Our proposed method has lower classification error and requires much less computations as compared to other existing advanced methods. فلاح علی، کنترل تطبیقی دست سیبرنتیکی با کنترل کننده شبکه عصبی، رساله دکترا؛ دانشگاه تربیت مدرس، 1374. Hudgins B., Parker P., Scott R.N., A new strategy for multifunction myoelectric control; IEEE Trans Biomed Eng, 1993; 40(1): 82-94. Englehart K., Hudgins B., A robust, real-time control scheme for multifunction myoelectric control; IEEE Trans Biomed Eng, 2003; 50(7): 848-854. Huang Y., Englehart K.B., Hudgins B., Chan A.D.C., A Gaussian mixture model based classification scheme for myoelectric control of powered upper limb prostheses; IEEE Trans Biomed Eng, 2005; 52(11): 1801-1811. Englehart K., Hudgins B., Chan A.D.C., Continuous multifunction myoelectric control using pattern recognition; Journal of Technology and Disability, 2003; 15(2): 95–103. Hargrove L.J., Englehart K., Hudgins B., A comparison of surface and intramuscular myoelectric signal classification; IEEE Trans Biomed Eng, 2007; 54(5): 847-853. Chan A.D.C., Green G.C., Myoelectric control development toolbox; Proc of the 30th Conf on Med and Biol Eng Society; Toronto, Canada, 2007. Englehart K., Hudgins B., Parker P.A., A wavelet-based continuous classification scheme for multifunction myoelectric control; IEEE Trans Biomed Eng, 2001; 48(3): 302-311. نظرپور کیانوش، طبقه بندی سیگنال الکترومایوگرام سطحی با استفاده از آمارگان مراتب بالا، پایان‌نامه کارشناسی ارشد؛ دانشگاه تربیت مدرس،؛ 1384. Clancy E.A., Hogan N., Probability density of the surface electromyogram and its relation to amplitude detectors; IEEE Trans Biomed Eng, 1999; 46(6): 730-739. نظرپور کیانوش، شرافت احمدرضا، فیروزآبادی سیدمحمد، طبقه‌بندی سیگنال الکترومایوگرام سطحی با استفاده از آمارگان مرتبه بالا، مجله مهندسی پزشکی زیستی، دوره اول (جدید)؛ پائیز 1386، شماره سوم، صفحات 1890-200. Nazarpour K., Sharafat A.R., Firoozabadi S.M.P. ; A novel feature extraction scheme for myoelectric signals classification using higher order statistics; Proc of the 2nd Int IEEE EMBS Conf on Neural Eng, Arlington, Virginia, 2005: 5-8. Nazarpour K., Sharafat A.R., Firoozabadi S.M.P., Surface EMG signal classification using a selective mix of higher order statistics; Proc of the 27th IEEE Annual Conf on Medicine and Biology; Shanghai, China, 2005: 4208-4211. Principe J.C., Xu D., Zhao Q., Fisher J., Learning from examples with information theoretic criteria; Journal of VLSI Signal Processing-Systems, 2000; 26 (1-2): 61-77. Jenssen R., Erdogmd D., Principe J.C., Eltoft T., Towards a unification of information theoretic learning and kernel methods; IEEE Workshop on Machine Learning for Signal Processing, 2004: 93-102. Santamaría I., Pokharel P.P., Principe J.C., Generalized correlation function definition, properties, and application to blind equalization; IEEE Trans Signal Processing, 2006; 54(6): 2187-2197. Liu W., Pokharel P.P., Principe J.C., Correntropy a localized similarity measure; Proc of the Int Joint Conf on Neural Networks; Vancouver, BC, Canada, 2006: 4919-4924. Liu W., Pokharel P., Principe J., Correntropy properties and applications in non-Gaussian signal processing; IEEE Trans Signal Processing, 2007; 55(11): 5286-5298. Jeong K.H., Principe J.C., The correntropy mace filter for image recognition; Proc of the 16th IEEE Signal Processing Society Workshop on Machine Learning for Signal Processing; Arlington, 2006: 9-14. Li R., Liu W., Principe J.C., A unifying criterion for instantaneous blind source separation based on correntropy; Journal of Signal Processing, 2007; 1872-1881. Gunduz A., Hegde A., Principe J.C., Correntropy as a novel measure for nonlinearity tests; Proc of the Int Joint Conf on Neural Networks; Vancouver, BC, Canada, 2006: 1856-1862. Xu J.W., Pokharel P.P., Paiva A.R.C., Principe J.C., Nonlinear component analysis based on correntropy; Proc of the Int Joint Conf on Neural Networks; Vancouver, BC, Canada, 2006: 1851-1855. Pokharel P.P., Agrawal R., Principe J.C., Correntropy based matched filtering; IEEE Workshop on Machine Learning for Signal Processing, 2005: 341-346. Pokharel P.P., Xu J.W., Erdogmus D., Principe J.C., A closed form solution for a nonlinear wiener filter; Proc of the IEEE Int Conf on Acoustics, Speech and Signal Processing; Toulouse, France, 2006: 720-723. Vapnik V., The Nature of Statistical Learning Theory; Springer Verlag; New York,1995: 140-146. رمضانی محمدمهدی، شرافت احمدرضا؛ کاهش خطا در طبقه‌بندی بی‌درنگ سیگنال‌های الکترومایوگرام سطحی با استفاده از کورنتروپی؛ پانزدهمین کنفرانس مهندسی پزشکی ایران؛ دانشگاه آزاد اسلامی واحد مشهد؛ زمستان1387.